The Razer platform co-founded with Sensics is well on its way to becoming a full fledged go-to for VR. With a long list of titles available including games from Steam, emulators and exclusives, Razer has made sure you'll have plenty to play once a consumer version of its Hacker Developer Kit hits. 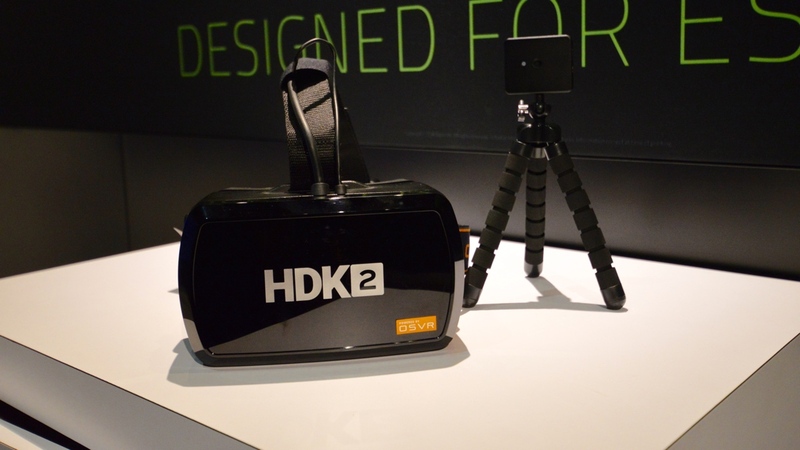 Until then, its still working to refine the hardware and with the latest open source virtual reality HDK 2 announced during E3 this year, it shows. The new OSVR headset hopes to rival the likes of Oculus Rift and HTC Vive with its 2160 x 1200 dual OLED display and respectably priced $399. That's the cost of upcoming PlayStation VR which is far lower than the Rift ($599) and Vive ($799). The HDK 2's display has a 90 Hz refresh rate, a 110 degree field of view and Razer is also promising that its 'Image Quality Enhancer' tech will reduce the screen door effect. There's also individual eye focal tuning to get the clearest picture, with Razer saying no glasses are needed - but more on that later. Razer OSVR HDK 2: So what's it like? During my E3 experience with the latest headset, I was excited to see what the next iteration would bring forth. My first go with the original Razer open source hacker developer kit headset (no wonder it's shortened) was at best, OK. In fact, it was mostly stomach churning, dizzying experience that was reminiscent of Oculus's early dev kit days. That said, because it was still so new, it was understandable. I had higher hopes for Razer's second go. Thankfully they delivered - at least on the display and latency side of things. First off, putting on the headset with glasses is something that needs to be fixed. The dials on the bottom are supposed to alleviate the issue for me and my fellow glasses-wearers, but it doesn't work if your vision is ridiculously bad (like mine). I know it can be done too - just look at what Vive's achieved; the earlier headset wasn't easy to put on but the consumer version works pretty well with glasses. Rift's a tight fit but it still can sit over my glasses decently enough. The whole glasses situation made the OSVR strap adjustments difficult so Razer's Jeevan Aurol, OSVR's product manager, had to actually hold it over my head. I'm sure it could have been tightened correctly but due to time constraints, we just left it as is (I was still able to turn my head). Next up, display. There's a noticeable difference between the original design's single screen and the two new 2160 x 1200 resolution OLED screens. There was still some picture stuttering when turning my head but I didn't feel sick at all playing the colorful racing game RedOut. I've actually also played a similar title with the first OSVR HDK called Radial Gand felt immensely sick afterwards. There's no controllers made specifically for the headset, and any Bluetooth controller can sync up with it. Razer has partnered up with Manus VR and Leap Motion for hand tracking gloves and of course, is opening up the system for whoever else wants to develop peripherals for HDK 2. There's also one camera for tracking, much like the Rift's system. While we say Razer's OSVR HDK 2 is a rival to Oculus Rift and HTC Vive, it really isn't. It's on the same level specs-wise now, but because the headset is based on developers modding the heck out of it, it's hard to give a definitive answer to whether this is the headset you should get. After all, depending on the dev, it could change within months. Then there's the issue of comfort. Aurol says there's definitely the possibility that a third iteration will see even more changes like a better fit, but wouldn't say anything else on the matter. A different design may involve upping pricing on the manufacturer side of things and thus would increase the price overall - much like how the two OLED's upped the OSVR from $299 to $399. It's still affordable but who knows, maybe Razer will have figured something else out by then that won't be drastically expensive. As it stands, the current cost of HDK 2 puts it in a rather unique position so if you wanted to try out PC VR, you very well could - and then even try modding the hardware yourself. Razer's even created a $5 million fund to help support potential OSVR developers to bring more content to its platform. Despite the dev fund, anything developed on OSVR is welcome to be developed on any other platform too which makes it an even more appealing program. Razer also notes that the dev fund isn't just to bring content to a specific platform but is meant to put content on all VR hardware in order to help drive the industry forward equally. Simply put, Razer's in it to win it for all of VR. The upgraded headset will ship in July so you won't have long to wait.